I’m so excited for 2017 to begin because I’m starting to FEEL that fit-feeling buzz and people are beginning to get serious about fitness again! There’s always a natural trail-off Fall through Winter but Jan 1 is like the ultimate Monday of the entire year and I can’t wait to see everyone getting hyped up again! I have to show you something guys. The prettiest pancake stack in the land. Are you ready? I’m not sure if you’re ready. I’m obsessed with rainbow food, as you already know, and healthy pancakes are always on my mind. So, pairing the two seemed like a perfect match. I took the “bigger is better” approach here…I mean you could totally make this for one or two people, but I decided to feed a crowd with it because, well, it just looks epic when it’s HUGE. You can cut my recipe in half to feed 3 people, or keep it the way it is to feed a crowd of 6 or more! Umm, it’s basically a cake. In a large blender, add the milk, applesauce, bananas, and eggs. Blend on low until smooth. Add in the oats and continue blending until smooth. Add remaining ingredients and pulse in to combine. Heat a griddle over low-medium. Coat with cooking spray. Divide batter into 6 servings (it’ll be 1 cup each) and cook about 2 minutes per side, or until golden. Lay down one pancake and spread lightly with nut butter (this keeps the fruit in place). Layer with grapes (or any fruit of your choosing). Repeat the layering process, ending with fruit on top. Cut into tall slices, and serve. Who do you want to feed this amazing pancake-cake to?!! I LOVE PANCAKES AND FRUIT!!!!! YEEEEEEEEEEEEEEEEEEEEEEEEEEEEEEEEEEEEEEEEEEEEEEEEE!!! Fabulous recipe, thank you so much Cassey! This is the first recipe of yours that I’ve tried and I absolutely love it (as did my family)! 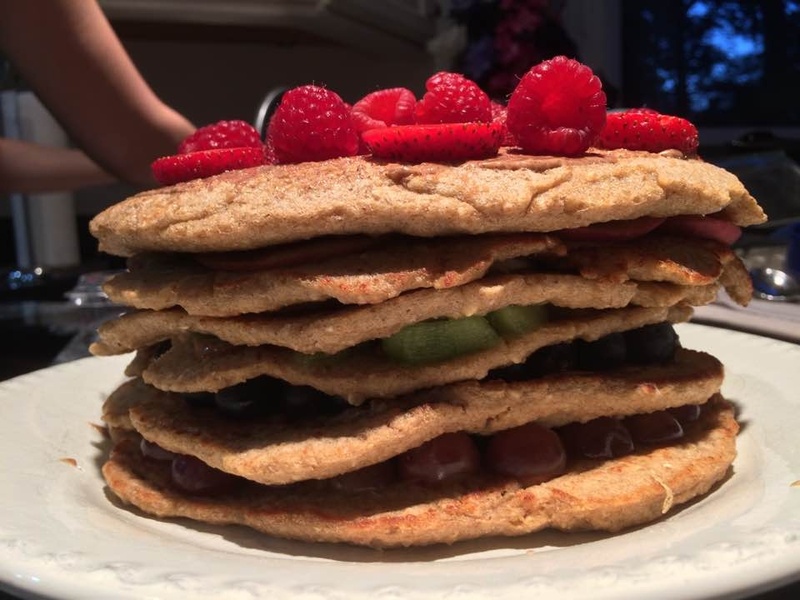 The pancakes themselves were dense and tasted great from the cinnamon and bananas, and the fruit layers and almond butter made it sweet and flavorful. It didn’t even need syrup. Can’t wait to try another one. Is this beautiful dessert 28 days reset friendly? This looks amazing, Cassey! and taste amazing, too. 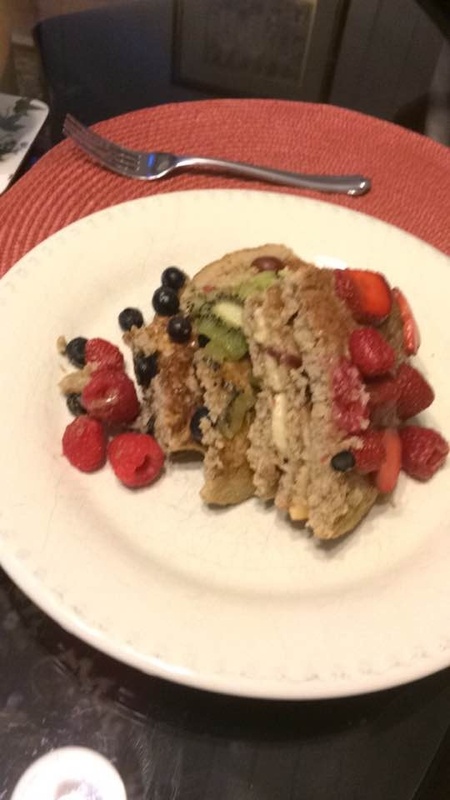 I also tried it and here is what came out: http://simonaionescu.com/healthy-blueberry-pancake-recipe/ Thank you for the inspiration and amazing vibes! This looks amazing! I’m always trying to find healthy alternatives to dessert, I can’t wait to try this out… maybe even for breakfast! Every time I try to make something from any website it turns out horribly or completely wrong. I’m not sure if I’m doing something wrong but it is really frustrating. I am in college so I’ve stuck to the ramen diet but I want to be healthy. It’s just hard when I’m spending so much money and not being able to eat it. Any suggestions?!?!?! another trick that helped me to eat healthy while in college: watch healthy eating ideas on youtube and substitute the veggies and/or other ingredients that I know I would eat or less expensive. I also use google for this and look for what i can substitute. No idea where you find the time and patience to assemble such a beautiful meal!